On Friday 8th March 1968, 20-year-old Gary McKay lost the lottery. He was conscripted. From a comfortable and carefree life of surfing and rugby football, he was drafted into the deadly serious preparation for war in the jungles of South Vietnam. In Good Company is his story told in his own words. It begins with induction and selection for the officer academy for national servicemen at Scheyville, a six-month 'pressure cooker' course which produced second lieutenants ready to lead troops into action against the Viet Cong. It ends three and a half years later with a burst of NVA machine-gun fire during a battle among enemy-held bunkers in the hills of Nui Le. Here is a grass-roots account of the blood, sweat and tears shared by a rifle platoon in jungle warfare, a straightforward story of the fears and the camaraderie which soldiers experience in combat. Gary McKay fashioned this account from his experience in action, leading his platoon. The detail is provided from the 80 letters he wrote to his wife while he served. He wrote his story for the reader who wants to know what the soldier on the ground went through - in the fetid jungle, in battle. Anyone who wants to understand what service in South Vietnam meant to those who were there should read this book. Gary McKay served as a rifle platoon commander in Viet Nam and was awarded the Military Cross for gallantry. 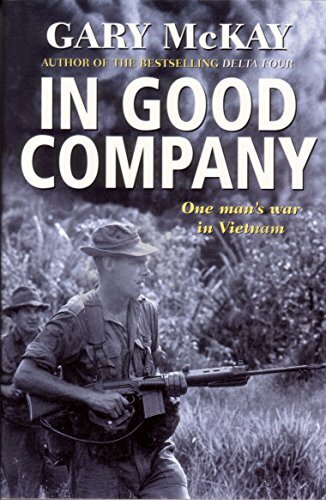 His time in Viet Nam was the basis of his bestselling 'In Good Company: One Man's War in Vietnam' His second book, 'Vietnam Fragments' recently re-released as 'Bullets, Beans and Bandages' is an invaluable oral history of Australia's war in Viet Nam. 'Delta Four' another bestseller, exposes the inner workings of a rifle company, giving the soldier's viewpoint of those aspects of war-fighting not found in the training pamphlets. His latest book, 'All Guts + No Glory' was written with Bob Buick and recounts Buick's experiences as a platoon sergeant in Viet Nam and in Australia's most famous battle at Long Tan. After almost 30 years military service, Gary retired from the army. He lives in Jervis Bay, NSW and currently works as a freelance historian and non-fiction writer.